David Sebel had emigrated from Russia circa 1912 and set up in partnership as a Wheelwright in East London in 1921. In 1928 he moved the Company to Lant Street in the Borough, London S.E.1 with the take over of a firm, Hazeldine & Norton, of Wheelwright’s & Motor Body and Van Builders. Interestingly the house next to the premises had been the residence of Charles Dickens when his parents were in the Marshalsea Debtor’s Prison. In the 1930’s they expanded into Architectural metalwork and other engineering projects. Also producing street cleaning carts, milk churns and fronts for Cinemas. In 1931 Harry Sebel, David’s son, joined the firm starting from the bottom up. During the Second World War the Company turned over to war work and several local premises were used for their production of aircraft and tank components, bunks for air raid shelters, bailey bridge components and even a tower for an experimental radar station. In the early 1940’s Harry was looking to the future and realised that they’re would be a need to expand the company and find work for the existing workforce and those which had been called up. After much research it was decided to go into metal furniture, under the Trade name Stak-a-Bye and into the toy business. But what to make which would be different from anyone else. Harry had the idea of a Rocking Horse which the rider could propel along themselves. Basic plans were drawn up and a full size horse mock up was made using bicycle gears. To get an idea of what the finished product would look like a Taxidermist in Piccadilly was approached for a horse hide, the only thing he had was from a Zebra so that was used. The prototype Zebra was still around at the Erith factory for several years. A Patent was taken out in 1942 for the basic mechanism. Later Charles Morewood, RA was commissioned to sculpt the clay body of what became the Mobo Bronco. The steel furniture business was set up in 1946 from the Weller Street side of the premises, a name which was used at the Erith factory to denote the furniture production building. The Lant Street premises were not going to be big enough for the toy and furniture business envisaged and so the ex Vickers Gun Works at 177, West Street, Erith, Kent were purchased in February, 1947. As the intention was to produce everything in-house from the arrival of the raw material to the finished product, the full kitting out of the factory with large presses, dip tanks, spray booths, etc. took a while. 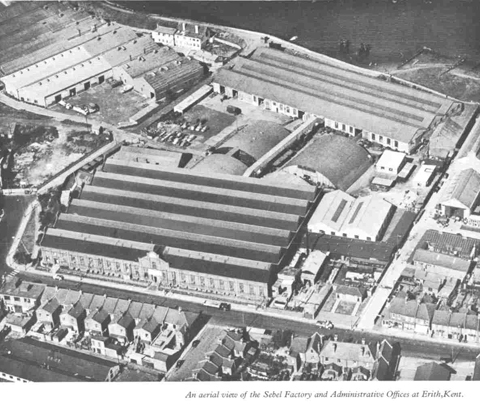 Toy production did not start at Erith until September, 1947. However, some toys had been assembled at Lant Street, produced by outside contractor’s, to enable a display at the British Industries Fair in May, 1947. The other toys on show were Merry Go Round, Rocker Swing, Chair Desk and Roll-a-Bye Skates. 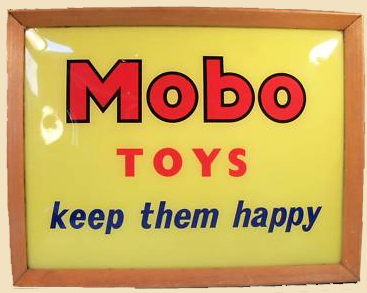 The name ‘Mobo’ came from a brain-storming session when ‘Mobile Toys’ had been rejected. The clown on the decal was due to an interest in the Circus by the David Sebel. The Circus theme was used in a lot of their Exhibition Stands and advertising. A tin clown was designed but never went into production. It would have been an early Action Man! Later advertising and instruction sheets used the Mobo title as two characters ‘Mr Mo’ and ‘Miss Bo’. The most well known toy is the BRONCO, the ride-on horse. It works by the rider sitting on the horse and pushing down on the stirrups, then releasing them and then the horse moves along. From 1947 to 1950 the Bronco could only be steered in a straight line, but in February, 1950 Magic Steering was introduced. This enabled the rider by pushing on either stirrup to move the horse in that direction. The Broncho was so popular that it stayed in production until 1971. The body pressings were also used for a series of other toys SPRING HORSE (PRAIRIE KING), NIGHT RIDER, PRAIRIE PRANCER, RANGE RIDER two different types produced, ROCKING HORSE, & BRONCO MERRY GO ROUND. The colours came from ‘market research’ with the local school children at West Street School – yellow and red being the favourite. These children were also used for photo shoots for advertising and testing the toys. In 1949, the WALKING SNAIL was introduced at the New York Toy Fair, also at the same fair the ‘PONY’ was first shown. The ‘Pony’ pressings went on to be used on several different toys – PONY ROCKER, PIONEER WAGON, PONY EXPRESS, PONY KART, PONY BUGGY, SURREY TROTTER, TODDLE PONY. 1948 also saw the introduction of the first small remote control walking toy – the TOY-TOISE. This was a great success not just for children, but also adults, as they were used for Toy-toise races at many parties. The SPANIEL – at first sold as PUPPY – and SPANIEL followed with the same mechanism, also a CANOE. The American Market was an amazing success for the MOBO Company. In 1948 they exported to the USA half of the total toy exports of ALL British Toy Companies. At this time Britain was recovering from the Second World War and steel was rationed according to the amount of goods exported. Mobo never had any trouble obtaining supplies because of their excellent export record. A New York office had been opened in 1948 at the Breslin Building, Broadway, New York and an American subsidiary formed Sebel Products Inc. Other major markets were Australia and South Africa. A Showroom & Office had been opened at 39/41 New Oxford Street, London W.C.1 in September, 1945. Other toys produced included Prams, Bicycles, Desks, Wheelbarrows, Rockers, Swings, Scooters and, from 1956, Pedal Cars. In 1951 Harry & David emigrated to Australia and set up a factory at Bankstown, Sydney. Here they produced both Toys and Furniture. The components were shipped from Erith and assembled and painted at Bankstown. The Australian company decided in 1957 to concentrate on the furniture business and so toy production was stopped. The furniture business still goes on today as part of the GWA International Group, and they have just opened a branch in the United Kingdom. In 1955 the Toy Boat business of Harold Flory Ltd., of Bromley, Kent was taken over. They produced the SNIPE, SWIFT, ST. CHRISTOPHER Motor Boats, the SPRITE YACHT, and the SNORT SUBMARINE, also Toy Cars. The boats were continued in production by Mobo. Jetex, the Model Aircraft Engine business, was purchased in 1956. Besides a range of Jet propelled engines they also produced model kits for aircraft and a plastic boats and cars for the Jetex engine. The mid 1960’s saw an introduction of toys made from injection moulded plastic and the importation of a range of plastic Pedal cars from Pines of Italy. These included a Chitty Chitty Bang Bang Pedal Car. A range of bicycles was also imported from Italy. By the late 1960s the British toy industry was having a difficult time due to cheap imports from the Far East. When John Bentley of Barclay Securities made an offer to purchase the Company in 1970 it was taken up. The Barclay Toy Group was formed to which Chad Valley, Charles Methuen and Tri-ang were added in 1971. Unfortunately the overheads of the Group meant that losses were still being made and a major reorganisation took place in 1972 with the Erith Works being closed and all production of all Mobo Toys ceasing. The site is now a large housing estate.